- - GB-02 Dental Stool has 4 functions, it is ergonomically designed and engineered. - - To fit human body to reduce stress and fatigue. - - Backrest and stool height are both adjustable. We are highly engaged to manufacture and supply a qualitative range of Pneumatic Stool to our valuable clients. - Pneumatic Stool with vertical height adjustment and smooth balanced horizontal movement of five castor's wheels. 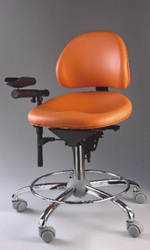 In compliance with set industry standards and norms, we offer a wide range of Dental Hospital Stools. These stools are designed using superior raw material, which is sourced from the reliable vendors of the market. 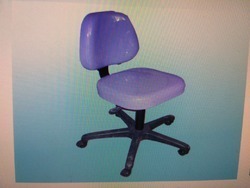 Our clients can avail from us ergonomically shaped Dental Stools that are long lasting and comfortable. Available in various dimensions, shapes and designs, these stools are widely demanded in clinics, hospitals and medical institutions. Durable and reliable, our range can be availed at industry leading prices. We are Leading Manufacturer, Supplier and Wholesaler of Dental Hospital Stools in Chennai, Tamilnadu, India. - Ergonomic: The large, anatomically-shaped backrest supports the lower back and the ergonomic tilt reduces strain and fatigue, ensuring proper circulation to lower extremities and promoting a healthy posture. - » Easy-to-adjust: Seat height and torso support easily adjusts from the seated position. - Comfortable hand rest with up & down adjustment.